One day in the life or Arthur Curry. One day in the life of a king. One day in the life of a hybrid, son of the land and the sea. For many people he's a legend. For other people he's a joke. However, who is in fact the hero known as Aquaman? Let's start from a very important point: Aquaman has always had much more possibilities as a character than his writers really explored. Aquaman has the potential to become an epic story, a under the sea 'Lord of the Rings'. It just doesn't happen. I remember growing up watching the Saturday morning 'Super Friends' cartoon and I never quite understood Aquaman, who always seemed to be talking to sea life. For a while I thought that was his thing, his power. Also, I never saw any kid proudly playing with an Aquaman action figure. Even when I started reading comics I enjoyed his iconic status, but I was never really into his adventures. I didn't even read any of his solo issues during the New 52 relaunch, but I'm giving it a chance now. Aquaman Rebirth #1 comes to change this idea people may have about the character. Right in the beginning a mysterious narrator explain something about the oceans, their immensity. Two-thirds of the planet; ninety-seven percent of the global biosphere... And deep down there there's a man who claims it as his kingdom. A man who, as he says, has more enemies than friends. Arthur Curry... Aquaman, the King of Atlantis. 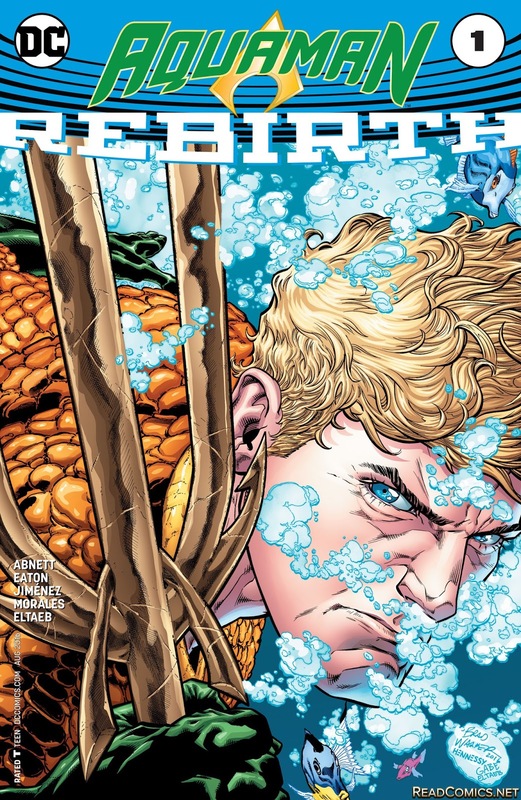 However, being the son of a Atlantean royalty and surface-dweller doesn't make Arthur's job any easier. People in the land accept him for they fear what may happen if Aquaman one day decides to turn his back against them. Sea people accept him for his royal heritage, but most of them don't see with good eyes the good neighbor policy implemented by the ruler. In other words, Arthur is tolerated by both worlds; not really loved by them. This sense of moral, the need to protect both worlds, with not so many allies makes Aquaman a little more interesting character to me. The balancing piece in the king's life seems to be Mera, the one he loves and who's supportive of his decisions. 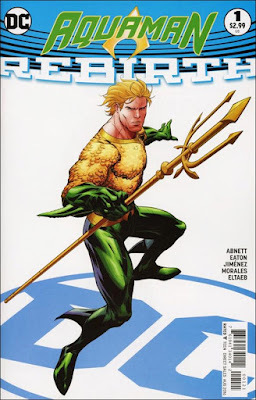 In fact, Atlanteans respect Arthur more because of Mera's influence than for any other reason. So, what would happen to Arthur's life if the woman he loves is taken from him? That's the one question the mysterious narrator wants the answer for. Dan Abnett made a incredible job with his writing in this issue: He explained the character (in more ways than you may first see - may require a second reading), he showed us both of his worlds, he showed his allies and enemies, and gave us an interesting cliffhanger. The art was not groundbreaking, but Mark Morales and Oscar Jiménez know their crafts and delivered some inspired pages; especially the under the sea panels. As it was written before, the whole issue is a day in Arthur's life. It has the ruler of the oceans dealing with an Atlantean terrorist with plans to attack the dry lands. In a few pages we can see Aquaman is more than a "fish whisperer"; he's a true warrior. A hero. A force to be reckon with. And I'm excited, not to say curious, to see what comes next for this underestimated persona.